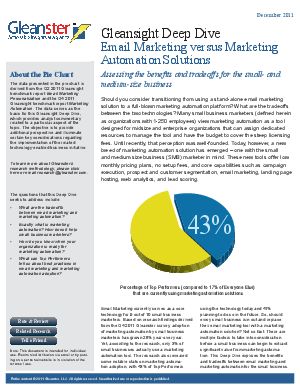 Do you wish your email marketing system delivered just a bit more functionality? Are you spending lots of time managing multiple tools and correlating the data they provide? Would it be useful if your CRM and email were tightly integrated? Maybe it's time to consider a marketing automation solution. This new report from Gleanster Research will help you learn how marketing automation differs from email marketing, where the overlaps are, and when it makes sense to move up, see a comprehensive comparison of core features, mapped to business purposes, and learn when, why and how top-performing organizations use marketing automation.